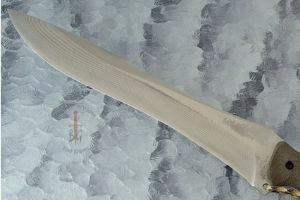 Blade thickness (near tip): 0.13 in. 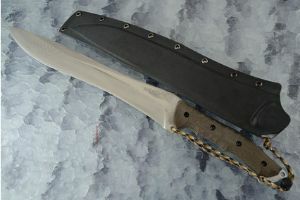 Kiku developed this large machete for "Gunny," an S.O.G. ambassador, and presented it to him at the 2015 SHOT show. 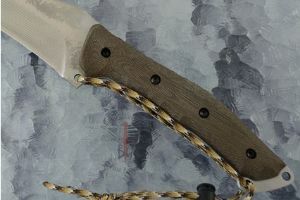 Gunny used several different machetes in the Vietnam War and wanted something special from Kiku, one of his favorite makers. 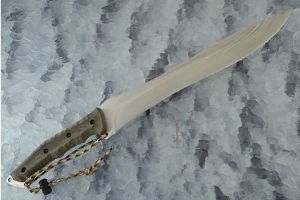 Deceptively nimble for its size (the 21 inch long knife weights in at just over a pound! ), the Bolo-Chete combines the versatility of a machete with the cutting efficiency reminiscent of a kukri. 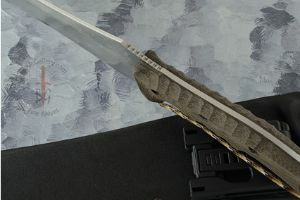 The 14-1/2 inch blade is a san mai created from many layers of damascus steel surrounding a premium Super Gold 2 powdered metallurgical steel center core. It is ground in Kikuo's hamaguri-ba (convex) style for strength and durability. 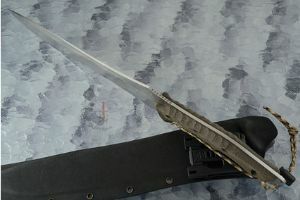 The oversized handle scales are made from OD green canvas Micarta, carved for traction and comfort while carrying or using. Expertly placed jimping on the spine provides extra traction for the thumb while Kikuo’s unique paracord lanyard setup ensures extra retention in hand. 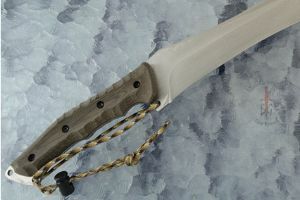 A hand fitted Kydex sheath with Tek-Lok accompanies the knife. This is sure to be a reliable companion to depend on in any adventure! 0.2958984375 0.0927734375 295.8984375 92.7734375 Trailer Completed.